Since Earth Day was Sunday we spent some time cleaning up around the house. After spending time scrutinizing our belongings we determined that we could use some unloading of our excess. After sorting through numerous toys and clothing we created some substantial donation piles. While we have done well to clear out our basement and rooms of things we just do not use any longer we looked to our kitchen. Food waste is one of the biggest problems in America and right here in my own home I too was a culprit. So much stuff in the pantry and little of which I knew was there. And then it was born. The challenge. The Mister threw down the challenge of making meals with what we have on hand as a way to eat through our stockpile of food. And truthfully it does seem like a stockpile when you can't even recall the items in your pantry. The first item on my bust our food stash was my squash penne. I used frozen squash puree from last fall's garden harvest to create a sauce for the penne. After supper the girls and I made dessert. We had leftover angel food cake lingering around from last week's strawberry shortcakes. With the supply of farm fresh picked strawberries gone that angel food cake just sat around all week with nothing to do. Instead of tossing out that cake or letting it get so icky that it would need to get tossed I pondered a bit and came up with a plan for that cake. I knew I had a jar of raspberry preserves that was left over from Christmas cooking baking that would make a good trifle base with that cake. All I would need next was some fruit. I always have loads of frozen fruit in the freezer. Most is from our summer visits to local farms where we picked our selves silly with fruit. Unfortunately I was clean out of raspberries, but there were plenty of blackberries. I pulled them out and let some thaw while I went on the search for the rest of the ingredients. I remembered seeing some peaches both frozen and canned in the house. Peaches always seem to compliment berries. After thawing out those peaches I knew they looked sad. The only bag I had was the local grocery store brand and those peaches just looked like they would taste awful. I was correct. Freezer burned and unripe they were terrible. Reluctantly I sought my back up the last jar of canned peaches from the local Big Bin store. I've saved these beauties for days where we needed some sweetness to our suppers. I love serving fruit with supper as a during the meal dessert and those peaches were always a big hit. 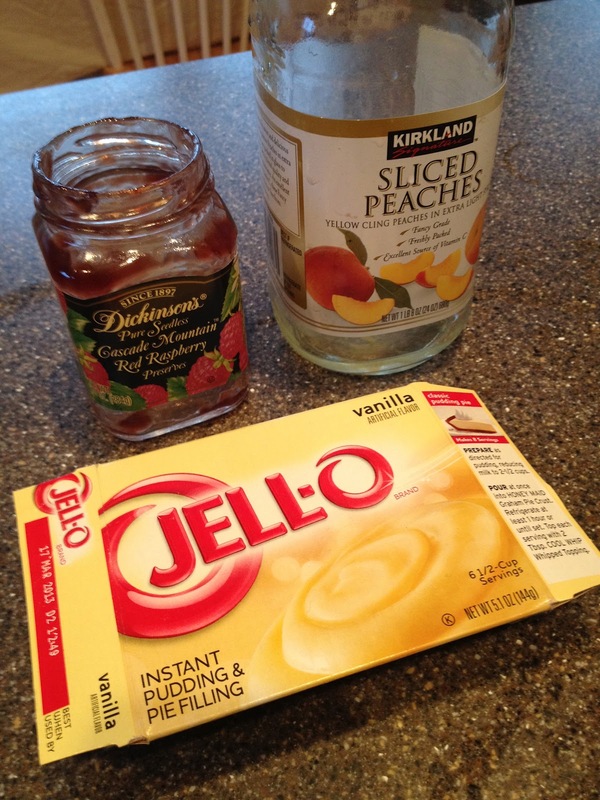 I grabbed that one pound jar of peaches and set it to draining in the sink. Next I ransacked my pantry looking of that box of instant vanilla pudding I knew was lurking in there someplace. Once everything was in order we got to assembling the trifle. I began to cut up the angel food cake into 1" cubes setting them aside in a bowl. I mixed up the instant pudding according to the package instructions. While I let the pudding set a bit I scooped out the raspberry preserves into a microwave safe bowl. I warmed the preserves to a syrupy consistency. Now on to the fun part. I poured a little bit of the pudding into the bottom of my trifle dish. Next I sprinkled some of the cake cubes into the pudding. I carefully drizzled the preserves onto the cake cubes. I spooned a third of the fruit over the cake. I repeated the layers 2 more times finishing with a layer of cake and the remaining pudding. 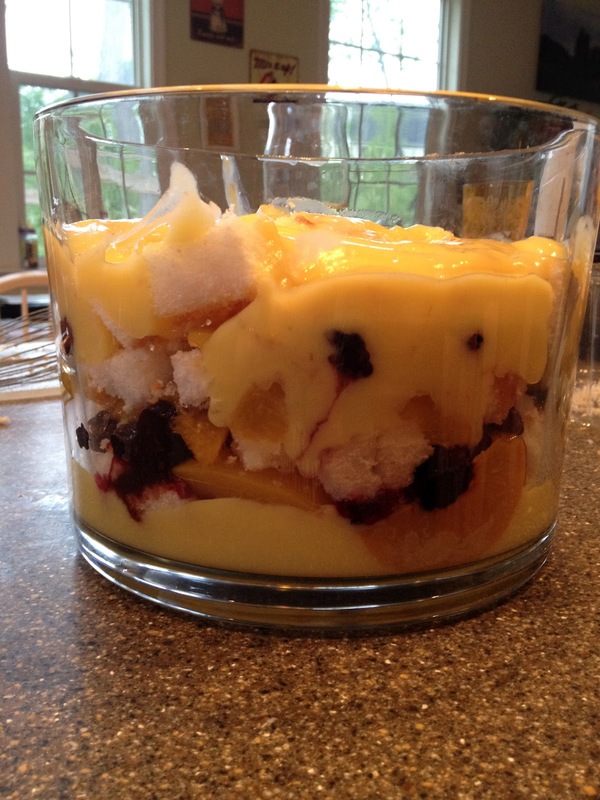 I put the trifle in the refrigerator to chill for 2 hours. I'll say not bad for a trifle being made from items in the pantry or freezer. Although a trifle made from fresh fruit is amazing this was pretty darn good. I might just keep this in mind for a last minute dessert idea for guests. **Although the raspberry jam was fine with this trifle I think that I should have opted to use a peach jam instead. The peach jam would have complimented the blackberries without drawing away from their flavor.